Published: Jan. 31, 2013 at 12:49 p.m. Updated: Jan. 31, 2013 at 02:30 p.m.
NEW ORLEANS -- David Akers is done. Over four consecutive days, the San Francisco 49ers kicker has been answering different strains of the same basic question: Why do you stink? For a guy who's been to six Pro Bowls during a long and successful career, Akers deserves better. But such is the nature of the Super Bowl beast. Around The League asked Akers his frustration level after a week of redundant questioning. "Oh, the same thing over and over and over again?" Akers replied in a half-joking, half-serious tone. "Where's the horse? Because we've been beating it a lot." Akers has missed 14 field-goal attempts this season, including a 38-yarder in the second half of the NFC Championship Game win over the Atlanta Falcons. 49ers coach Jim Harbaugh announced a day later he would stick with Akers, struggles be damned. "He's been hitting the ball very well. He's had some really good hits on the ball that haven't gone through and we'll live with that," Harbaugh said Thursday. "We know what he's capable of doing. We know as long as he's going through his process, practicing, working at it that we'll get the results. We're very confident he'll have a big day in the Super Bowl." We asked if a 4-for-4 Sunday with six touchbacks would wipe away the bad taste of the last few months. "Honestly, no. It's been a tough season personally. But, I'm trying to relish in the fact of what this team's accomplished and I've had a lot of great accomplishments in my career," he said. 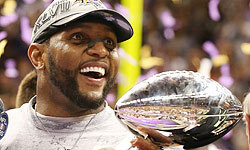 "Obviously, going to six Pro Bowls and things like that, and I don't have a Super Bowl ring. So that, as a player, you would love to be able to have that. "I've got the ring that says conference champion, but it'd be incredible to have one that said world champion."